T. C. Moore : Swimming Skee, California, 1914. 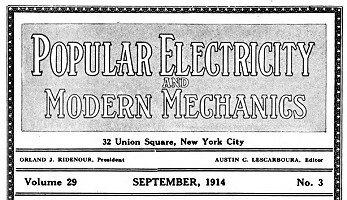 The Modern Publishing Company, New York, September 1914. This unusual craft was designed and ridden by T.C. 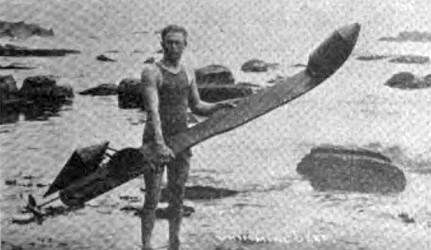 Moore in California in 1914, as described in this article. 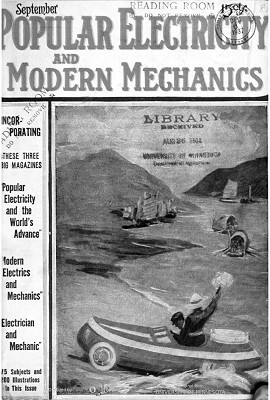 A more extensive report, without identifying the inventor, was printed the following year in Outing Magazine where the craft was named as a Water Skee. 1915 Outing Magazine : The Water Skee. young Californian inventor, has designed a propelling surfboard operated by pedals in much the same manner as a bicycle. It is called the "swimming skee," owing to the way in which the end of the board is curved upward, making it resemble a snow skee. The affair is a substantial one, as all the parts, with the exception of the galvanized iron air tanks, are of bronze. This prevents rusting of the metal parts exposed to the action of the salt water. Considerable speed may be made on the new invention. The young inventor has gone more than two miles out to sea on it at Long Reach, where he rode through the surf with ease. One thrilling adventure he had was an encounter with a herd of seals at San Pedro, where he makes his home. They tried to tip him over, but failed, as the air tanks prevent capsizing. In climbing the big waves and rollers it is often lifted high in the air to glide down again with great velocity. Surf Board Designed by a Californian. The 8urf Board, Showing Air Tanks, Propeller and Driving Mechanism. Geoff Cater (2017) : T. C. Moore : Swimming Skee, California, 1914.